Keri Russell is going to be in Star Wars 9 even though, for a hot second, it seemed like maybe something was going to prevent the actress from reuniting with J.J. Abrams. Russell previously worked with the prolific filmmaker on the show Felicity, which was a pivotal moment for both of their careers. That made the news of Russell joining the cast of Episode IX all the more exciting. However, Lucasfilm initially excluded her from the official cast announcement for the movie, which had some wondering if she perhaps wasn't going to be heading to a galaxy far, far away after all. Fear not. 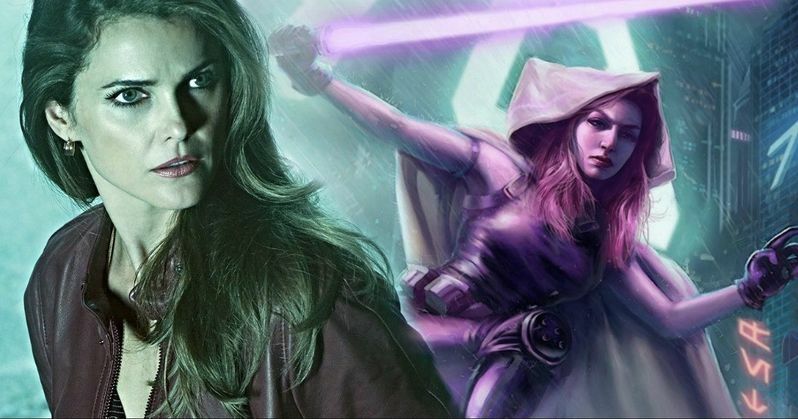 According to a new report from Deadline, there's a good reason Lucasfilm didn't include Keri Russell who recently wrapped a terrific run on FX's The Americans, in their announcement. Apparently, Russell hadn't actually locked down her deal by the time the studio wanted to release the news, so they couldn't actually list her until the deal was good and truly done. So the previous reports of her casting were in no way untrue. In fact, Lucasfilm has since updated their original story to include Russell. So that's that. Here's the official updated cast list. "Returning cast members include Daisy Ridley, Adam Driver, John Boyega, Oscar Isaac, Lupita Nyong'o, Domhnall Gleeson, Kelly Marie Tran, Joonas Suotamo, and Billie Lourd. Joining the cast of Episode IX are Naomi Ackie, Richard E. Grant, and Keri Russell, who will be joined by veteran Star Wars actors Mark Hamill, Anthony Daniels, and Billy Dee Williams, who will reprise his role as Lando Calrissian." Regardless of what went on behind the scenes, she's going to be one of the new Star Wars cast members joining what the studio is billing as the final chapter of the Skywalker saga. The other new cast members include Naomi Ackie and Richard E. Grant. As one might expect, no details have been revealed in terms of who any of these newcomers are going to be playing. It's anyone's guess at this point, but there's already been plenty of speculation amongst the fans as to whether or not Russell is playing Rey's actual mom. Or is she Mara Jade? Mark Hamill has also been confirmed to be returning as Luke Skywalker in some form or another. Vegas odds are on Force ghost, but we can't rule out a flashback or some unforeseen curveball. It's also been revealed that the late Carrie Fisher will appear as Princess Leia via some unused footage from The Force Awakens. Lucasfilm had previously made it clear that they weren't going to recast the role, nor were they going to use CGI like they did in Rogue One to recreate Peter Cushing's likeness for Grand Moff Tarkin. In addition to Felicity, Keri Russell and J.J. Abrams previously worked together on Mission: Impossible III, which marked his feature directorial debut. Cameras are set to begin rolling on Star Wars 9 next week on August 1st in London at the famous Pinewood Studios. Abrams took over as director for Colin Trevorrow, who parted ways with Lucasfilm over creative differences. Star Wars Episode IX is currently set to hit theaters on December 20, 2019. This news comes to us courtesy of Deadline.